The Main Suite, our newest unit, was formerly the innkeeper’s apartment. This welcoming two-room guest suite has a separate living room with an impressive library, cathedral ceilings, and a full-sized sofa bed. The sleeping area boasts one queen-sized bed with an adjoining studio-style dining area. 1- 4 people can be comfortably accommodated in The Main Suite. 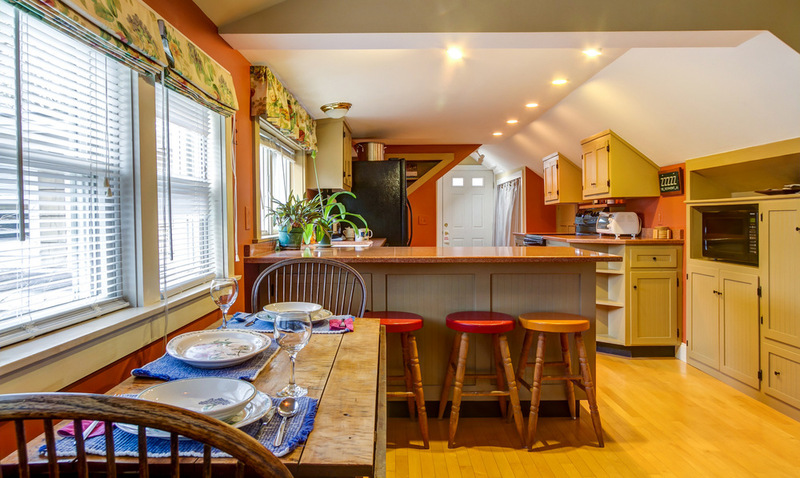 Its kitchen features granite counter tops and is stocked with dishes, silverware, cooking utensils, coffee & tea makers, a microwave, and a dishwasher, too! The spacious private bathroom includes a spa tub, shower, a built-in vanity, and complimentary toiletries. There is custom cabinetry throughout this unit, which also includes a private entrance, a washing machine, a clothing dryer, a flat screen television, and air conditioning. The Main Suite is accessed by an outdoor stairway that can be difficult for people with limited mobility. Children lodging with an attentive adult must be at least 7 years old to stay in this unit. The main suite is wonderful and it has everything that you would expect to have at home (including all kitchen facilities, a beautiful room with a lot of books and a comfortable sofa, beach chairs and umbrella to enjoy the seaside). We thank Danielle and her husband for their great hospitality. And before leaving we bought a fantastic map of Cape Cod in the Maps of Antiquity store. General Information - Each of our non-smoking rooms overlook our garden and offers maximum privacy with a separate entrance. Wireless computer access is available throughout the building. Please note that we are a guest house, offering clean, comfortable rooms at a great value, with in-room coffee and tea makers. No breakfast is provided, but there are plenty of great places to eat nearby! We are happy to offer information, lend guidebooks and maps, and help guest become aquainted with our area in order to make the most of their stays. Rates range from $135 to $195 for the Main Suite dependent on season and holidays. These rates are based on one or two people sharing one bed- additional beds or people are subject to additional fees. Cash/ Checks/ MasterCard/ Visa accepted. Rates are subject to change without notice and are only guaranteed with a paid deposit. Base rate= 1 or 2 people sharing 1 queen bed. Base rate + $25 = 2 or 3 people using 1 queen bed and 1 pull-out bed. Base rate + $50 = 4 people using 1 queen bed and 1 pull-out bed. Check-In time is after 3:00pm and check-out time by 11:00am. If you will arrive after 6pm, we ask that you kindly provide your approximate arrival time so that we are available to welcome you. 9.7% Room tax must be applied. It is not included in the stated room rate. A two-night minimum stay is generally required, with three nights required during our peak and holiday seasons. Additional charges may apply if stay is less than the minimum night stay requirement. Our guest rooms and main building are all non-smoking. A 100% deposit is required for peak season, short stays, holiday stays, and stays booked within 30 days of the arrival date. A 50% deposit is otherwise required with the balance due at least 30 days before arrival. Cancellations made prior to 30 days before arrival will be eligible for a refund, less a $50 reservation processing fee. Cancellations made 14-29 days prior to arrival, or for a shortened stay, will be eligible for a credit of the number of booking days to be used in the off-season within one year. This is a one-time, non-transferable credit and does not apply to holidays. Any reservation cancelled within 14 days before arrival will only be eligible for a credit for a future stay if a room is reserved at the time of cancellation. Thank you for your inquiry we will contact you shortly! Chatham Guest Rooms & Maps of Antiquity became certified in June, 2011 as level 1 Green Verification Cape Cod & Islands Businesses. Our businesses practice, support, and encourage conservation, recycling, and reduction of material use. Visit our Maps of antiquity website to see a portion of our over 15,000 antique maps from our shop.